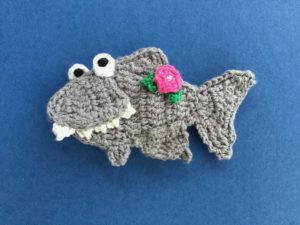 Welcome to my shark crochet applique pattern. 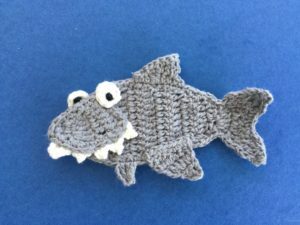 I was asked if I could design a family of shark finger puppets. 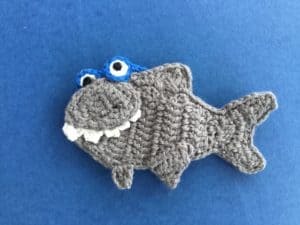 This week I’ll have the pattern for the bigger shark and the accessories and next week I’ll have the pattern for the smaller shark. 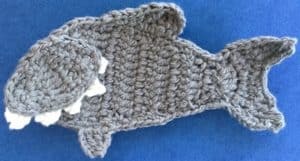 This is what the finished sharks will look like. 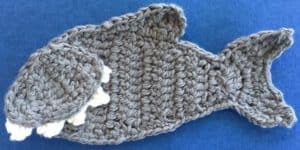 There’s also a video tutorial for this pattern available at shark crochet applique tutorial. 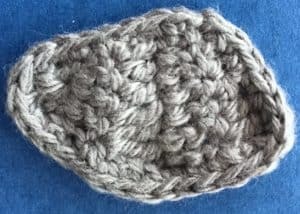 To view the complete pattern for free continue scrolling down this page. 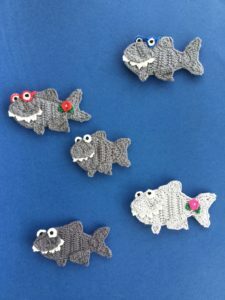 If you would like to download the ad free version, it’s available on my Ravelry store for $1 at Shark Crochet Applique Pattern. 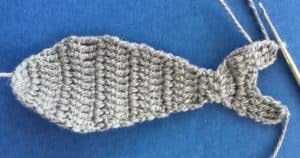 This pattern will be using US terminology. 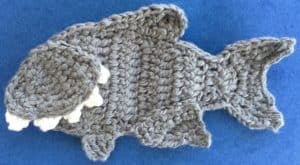 If you would like to view the UK version, go to Shark Crochet Applique Pattern (UK Version). 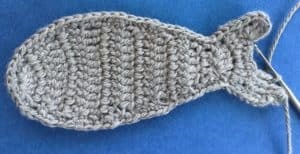 I used grey and white 4 ply crochet cotton. 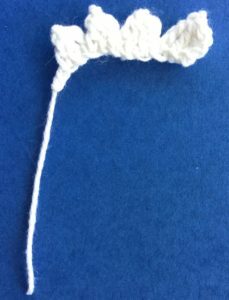 A crochet hook, I used a 1.25mm hook. 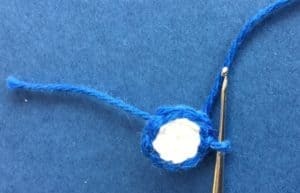 Darning needle to weave in ends. 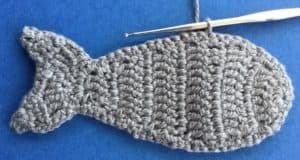 Sewing thread and a sewing needle to stitch the shark together. 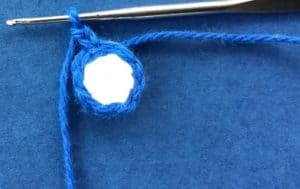 If making a finger puppet a small amount of felt. 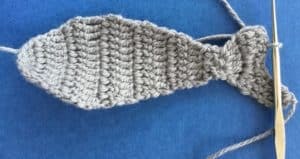 Using grey make a magic loop. Row 1: 3 ch, work 2 dc in circle. Pull circle tight but don’t join. Turn. Row 5: 4 ch, 1 dc in 1st st, 1 hdc in each of next 2 sts, 1 sc in each of last 2 sts. Don’t fasten off. 1 ch, work 1 or 2 sc in each st around. Sl st into 1st st. Fasten off. 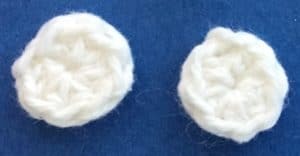 Row 1: 3 ch, work 6 dc in circle. Pull circle tight but don’t join. Turn. Row 15: 4 ch, a tr cluster over 1st 3 sts. Fasten off. Join cotton in the 4th last st on other side of tail. 4 ch, work a tr cluster over the next 3 sts. Don’t fasten off. Sl st in each st down tail, 1 or 2 sc in each st around the body to the tail, sl st in each st up to the 1st st at end of tail. Into the end of the tail work 2 ch and a joined hdc and fasten off. 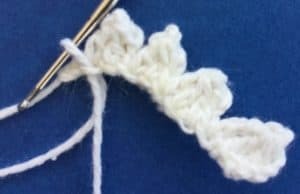 Join cotton in st at bottom of joined hdc, sl st in next st then work 1 sc in each st around the bend in the middle of the tail and up the other side to st before top, sl st in next st, work 2 ch and a joined hdc in top of tail. Fasten off. 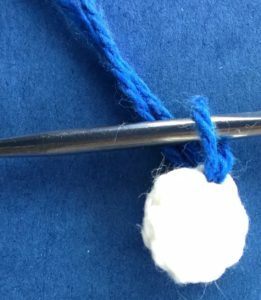 Join cotton 15 sts back from tail on wrong side. Row 1: 1 sc in 1st 2 sts, 1 hdc in next st, 2 dc in following st, 1 hdc in each of next 2 sts, 1 sc in following 2 sts. Turn. Row 2: 4 ch, a tr cluster over same st as ch and next 2 sts, 2 dc in following st, 1 sc in next st, sl st in each st to end. Fasten off. Miss 3 ch, a tr cluster over next 3 sts. Fasten off. Join cotton in same st as last part of tr cluster. 3 ch, a dc cluster over next 3 sts. Fasten off. Join cotton in same st as last part of dc cluster. 3 ch, a joined dc over next 2 sts. Fasten off. Join cotton in same st as last part of joined dc. Row 1: 2 ch, work 1 hdc in circle. Pull circle tight but don’t join. Turn. Row 2: 2 ch, 2 hdc in st, 1 hdc in top of ch. Turn. Row 3: 2 ch, 2 hdc in 1st st, 2 dc in next st, 2 tr in following st and 1 tr in top of ch. Turn. Row 4: 3 ch, 2 dc in 1st st, 1 dc and 1 hdc in next st, 1 hdc in following st, 1 sc in each st to end. Turn. Row 5: 1 ch, work 1 sc in each st to end. Fasten off. 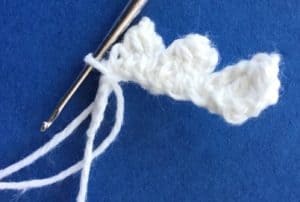 Using white make a magic loop. 1 ch, into circle work 8 hdc. 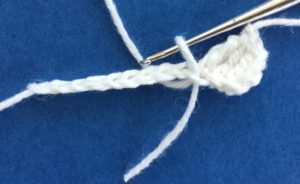 Pull circle tight and join with a sl st in top of 1st st. Fasten off. Weave in ends. 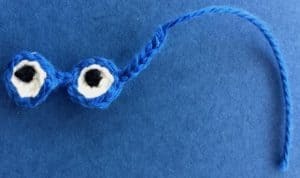 Embroider a black dot on each eye. Stitch the teeth in behind the head. 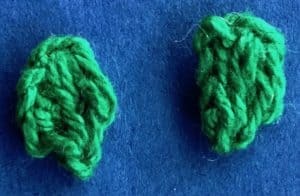 Sew the head to the body. 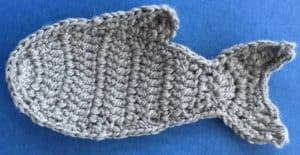 Crochet the small bottom fin on the bottom of the shark as pattern below. 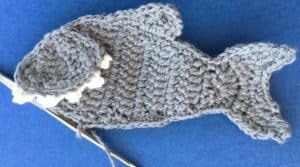 Attach the large bottom fin to the shark. 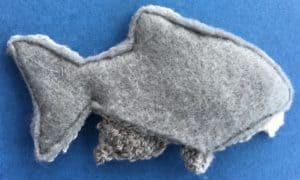 If making a finger puppet stitch the felt to the shark leaving it open between the 2 bottom fins. 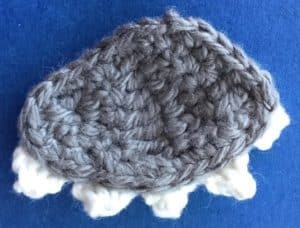 Stitch the eyes to the shark. 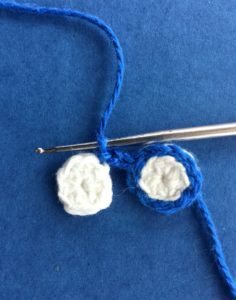 Join cotton at bottom of body under 2nd last tooth. 5 ch, work a cluster of 1 tr in same st as ch, 1 dc in next st and 1 tr in following st. Fasten off. 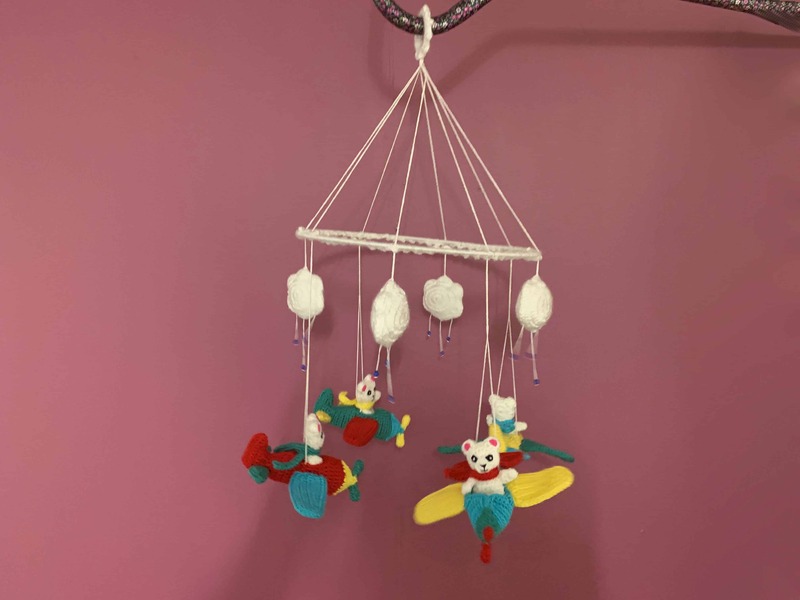 I used blue, pink and green 4 ply crochet cotton. Sewing thread and a sewing needle to stitch the accessories onto the shark. 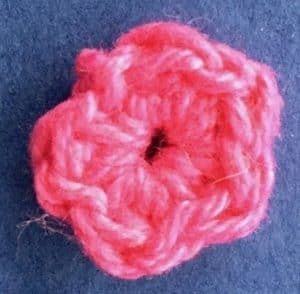 A small bead for the centre of the flower. 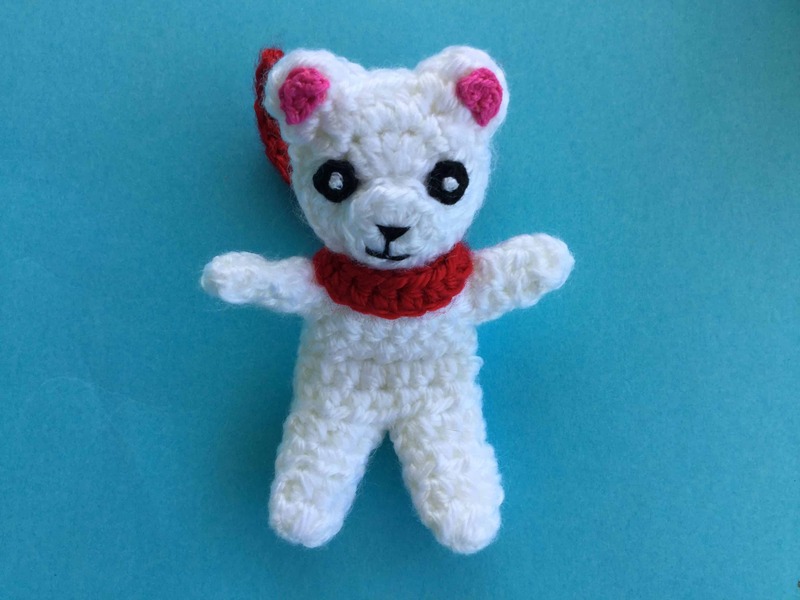 Join cotton to outside loop of one eye. Work a sl st in the outer loop of each st around first eye. Join with a sl st into 1st sl st. 2 ch. Sl st into outer loop of next eye and work a sl st into the outer loop of each st around eye. Join in 1st st and fasten off. 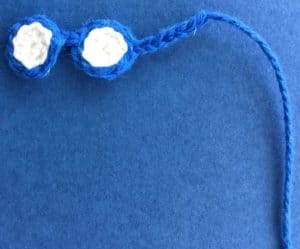 Join cotton to side of glasses. Work about 6 ch. 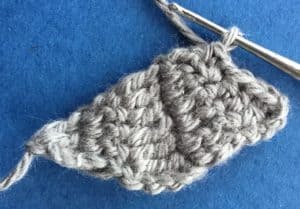 Fasten off leaving a tail to attach behind the shark’s fin. Weave in ends. 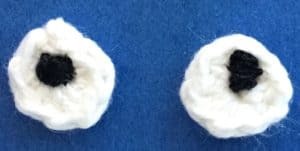 Embroider on eyes. 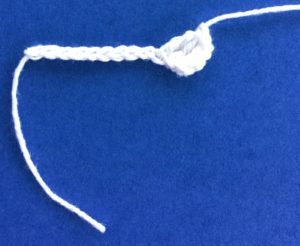 Stitch the glasses to the shark as shown. 1 ch, into circle work (1 sc, 1 dc) 5 times, pull circle tight and sl st in 1st st. Fasten off. 3 ch, work a joined dc into circle. Pull circle tight but don’t join. Fasten off. Weave in ends. 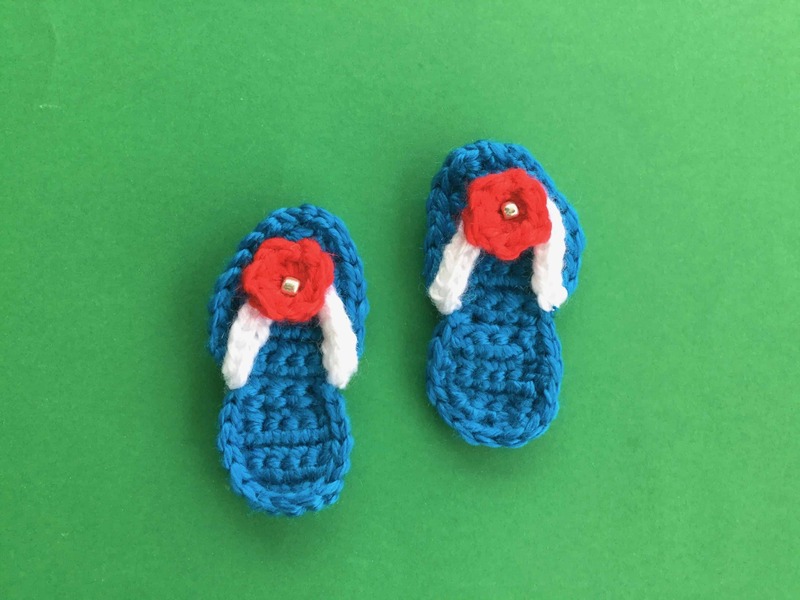 Attach the leaves to the flower. 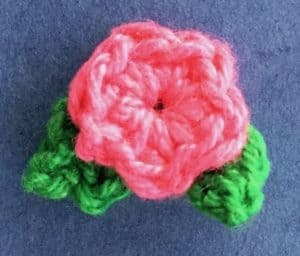 Attach a bead in the middle of the flower if desired. Attach the flower to the shark. 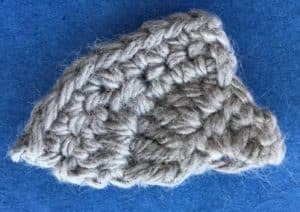 Copyright Kerri's Crochet 2017 | All Rights Reserved | We are a participant in the Amazon Services LLC Associates Program, an affiliate advertising program designed to provide a means for us to earn fees by linking to Amazon.com and affiliated sites.